Today’s guest blog was originally published on The Connected Cause blog maintained by Heller Consulting and appeared on August, 1, 2014. Recently Heller Consulting’s Vice President of Professional Services, Smita Vadakekalam, was asked to participate in an AmeriCorps Alums webinar to talk about her career in Philanthropy and how she got there. Below is a recap of her experience with the webinar as well as her journey with AmeriCorps. In May I participated in a webinar titled “Careers in Philanthropy” conducted by the AmeriCorps Alums. There were 2 additional panelists who had also served in AmeriCorps and attended The Indiana University Lilly Family School of Philanthropy. I was happy to participate, and was able to reflect on how my experiences as an AmeriCorps member and student of philanthropy connect to the career I have now. I didn’t see it at first, but it soon became clear how my AmeriCorps year at a nonprofit housing developer plus my two years studying philanthropy brought me to Heller Consulting to work in nonprofit technology. During my AmeriCorps year, the members were all assigned to work at a local nonprofit in a specific neighborhood in Washington, DC. We were all working in direct service and facing head-on the typical issues that plague a neighborhood with a rich history in the midst of a transition. There were a lot of “feel good” moments, but there were more moments when we left our sites with our heads pounding with confusion and questions. I’ll never forget those discussions with my AmeriCorps group: brutally honest, centering around race, class, economics, and more. We didn’t always walk away with answers from those discussions, but I walked away recharged and motivated to continue on. I was first introduced to the term “reflective action” at the Jane Addams fellowship at IUPUI Center on Philanthropy. Reflective action means to always act, but always ask the question of “why” and reflect on those actions. This concept is very appealing to me because it strikes the right balance of theory and practice. The nonprofit sector is full of passion-orientated people, and most nonprofits’ missions and core existence are organized around a passionately held principle. There is a lot of ‘acting’ when working at a nonprofit, but there’s also the need to constantly reflect on our actions to make sure we are moving forward in the right way. During my first year studying philanthropy, we sat at a small table in the basement of our professor, Mr. Robert Payton, surrounded by his personal library of over 1,000 books. We read the classics, feminist writing, theology, western and eastern philosophy, fiction, current politics, and much more. In some way, shape or form, we discussed and connected this all back to philanthropy. That was Mr. Payton’s point. He wanted us to go out into the world as doctors, technicians, artists, professional fundraisers, or activists and take away the thoughts, ideas, and the practice of reflective action. This is how we make change in society. It will come in all shapes and forms, but it is all-important. At Heller Consulting, we walk into an organization to help fix a problem, streamline a current system, devise a technology strategy, or implement a new technology. But, more importantly, the work that we are doing on our projects is asking the question of “why?” Why is this important? How does this connect to the larger change we want to make in society in a positive way? How does this work help an organization further their mission? These questions are what keep me engaged and motivated to do this work. By seeing those connections, I ended up in a field I never expected. There are many different ways to make change, to make the world a better place, but it is up to us to open our eyes and to see those connections where they exist. We have the tools right in front of us. We can do that with technology, we can do that with our hands, our words, even the conversation you have with a stranger. Reflective action takes place not only in our jobs, but also in our daily lives. 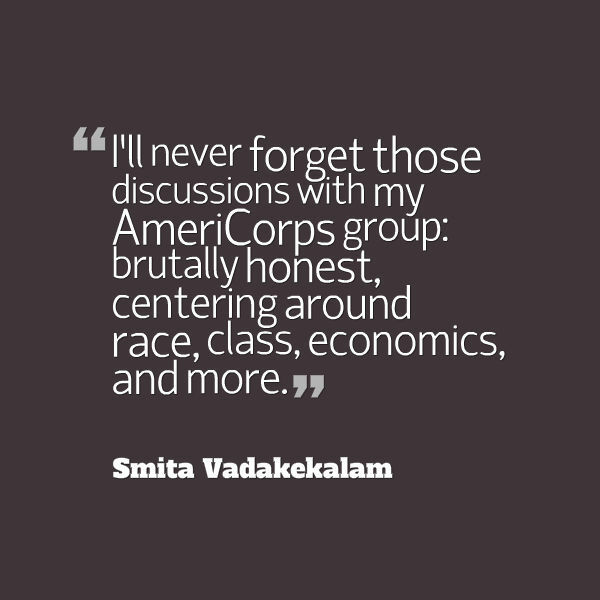 For more information on AmeriCorps click here to see the full webinar complete with Smita’s interview.